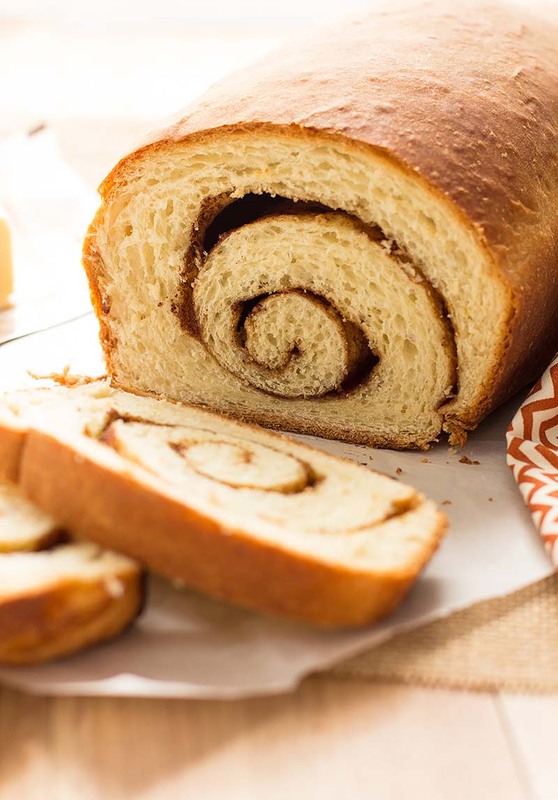 A nutty sugar-cinnamon filling swirled in rich bread loaves-extra good toasted! Add 2½ cups flour, yeast, sugar and salt to bowl of a stand mixer fitted with a dough hook; mix on low for 30 seconds to combine ingredients. In saucepan or microwave-safe dish, heat milk, water and butter until warm (120°-130°F; butter does not need to melt). Add milk mixture to flour mixture. Mix on low until just combined. Add eggs. Blend at low speed until moistened; mix 3 minutes at medium speed. Turn the mixer down to low and slowly add enough of the remaining flour until dough is firm and no longer sticky. Turn mixer to medium speed and knead for 4-6 minutes, or until dough becomes smooth and elastic. (OR - By hand, gradually stir in remaining flour to make a firm dough. Knead on floured surface until smooth and elastic, about 5 to 8 minutes. Place dough in lightly oiled bowl and turn to grease top. Cover; let rise until dough tests ripe, about 60-90 minutes. Prepare Filling: Add brown sugar, nuts and cinnamon in a bowl, whisk to combine; set aside. Punch down dough. Divide into 2 parts. On lightly floured surface, roll or pat each half to a 14 x 7- inch rectangle. Brush each half with half of melted butter; sprinkle half of Filling over each dough. Starting with shorter side, roll up tightly, pressing dough into roll with each turn. Pinch edges and ends to seal. Place in greased 9 x 5- or 8 x 4- inch bread pans, seam-side down. Cover; let rise in warm place until indentation remains after lightly touching, about one hour. Bake in preheated 350°F oven for 35 to 40 minutes until golden brown. Cool in pans for 30 minutes before removing. Transfer to wire rack to cool completely. You can substitute Instant (fast-rising) yeast for Active Dry Yeast. Traditional methods- replace 1:1. Expect your dough to rise faster; always let your dough rise until ‘ripe’. Bread Machines- use ½ tsp Instant yeast (or ¾ tsp Active Dry yeast) per cup of flour in your recipe. Visit our Lessons in Yeast & Baking for more information. Recipe featured at One Sweet Mess.